All of us know that losing weight is a factor of burning more calories than you consume, so if you can add a rowing workout 3-5 times a week without adding extra calories to your diet, you’ll lose weight. According to Harvard Health, a typical person will burn between 210 and 311 calories per half hour of moderate stationary rowing, depending on your current weight; the higher your weight, the more calories you burn, so you get a boost from the beginning. You can up that to 255 to 377 calories by engaging in vigorous rowing, which involves moving faster or with higher resistance on your rowing machine. Regardless, burning these calories puts you on the path to weight loss, especially if you are diligent in your diet as well, aiming for as many fruits, vegetables, and lean proteins as possible. One of the best reasons to choose rowing is the fact that it is a low-impact workout. One of the biggest problems that people tend to face in weight loss challenges is the tendency to go too hard on a high-impact exercise in order to burn a lot of calories. After such a workout, you may feel too tired and sore to continue working out consistently, or you may sustain an injury that requires recovery before you can really push yourself again. Low-impact but high-calorie-burning exercises like the rowing machine allow you to sustain your workouts long-term while seeing major results in weight loss. This is just what it says: find your most comfortable pace and notice how fast it is; even when you get tired, keep going at this pace and try to keep your routine going for at least 30-45 minutes. At least once a week, try for a slightly longer sustained rowing session, but recognize that this slow and steady workout may be the best way to get accustomed to the full-body workout that is rowing. Rather than staying at your comfortable pace, start there and then add one stroke per minute for each minute of your workout. For example, you might start at 20 strokes a minute and end at 50 strokes a minute. What is nice about this gradual approach is that you focus on the pace you need to set for each minute, not the end goal, and you surprise yourself by realizing you can actually do 50 strokes a minute. A modified version of this pushes you to your highest mark in the middle of your workout and then ramps back down after that, mimicking the intensity of running up and down a hill. If you really want a great workout for calorie burning, try to combine these types of workouts. Start with a ramp-up workout that lasts 30 minutes, then add one minute to your workout time in 2 days, working out for 31 minutes. Keep ramping up until you have both strong endurance (rowing for 60 minutes at a time or more) and strong power (high strokes-per-minute for a large portion of that workout). Your calorie burn comes from the combination of how long you go and how hard you go on the rowing machine, so find ways to push yourself in both of those directions to see your best possible results. Want to Max Your Burn? Have Great Rowing Technique! Start by sitting up tall as you row; you’ll get that burn in your core that shows you are working a little harder than when you hunch or slump. Push yourself with power strokes: quick, strong sets of 3 rapid strokes. You work your muscles more intensely for those seconds and build overall ability while melting the calories away. The evidence is in that cardio and strength training each do different things for your body that both help with weight loss. Cardio is often turned to first, since it burns a lot of calories, more than the typical weight lifting session. However, weight lifting has been proven to build the muscles you need to continue burning calories throughout your day, according to Healthline, since having more muscle helps you burn more calories at rest. 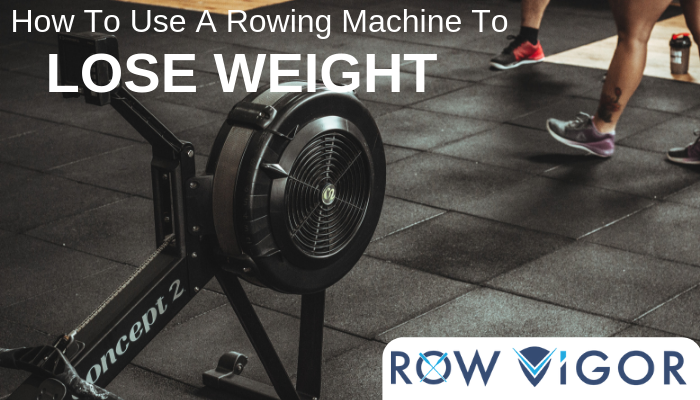 What makes rowing machines ideal for your weight loss workouts is that they do both, getting you to train your muscles with strength motion, but using the repetitive movement to also build a cardiovascular workout. By incorporating components of both, you get the benefits of both kinds of exercise, all in one smooth continuous movement. While many of us are excited about weight loss and will try to push ourselves on our own, the best way to feel truly motivated is to get someone to push you to that next level. ROW ViGOR provides the motivation you need to push yourself to the far end of the calorie-burning scale, making the most of every minute you actually get on the rowing machine. What’s more is that you can use the application to challenge your friends, turning what would otherwise be a solo workout into a game you get to play with others; many of us barely notice we are exercising when we are striving to beat a friend at a workout challenge. Download the app today and let’s burn those calories together!